For rapid, quantitative, bioluminescent determination of ADP concentration and evaluation of drug effects on ADP metabolism. 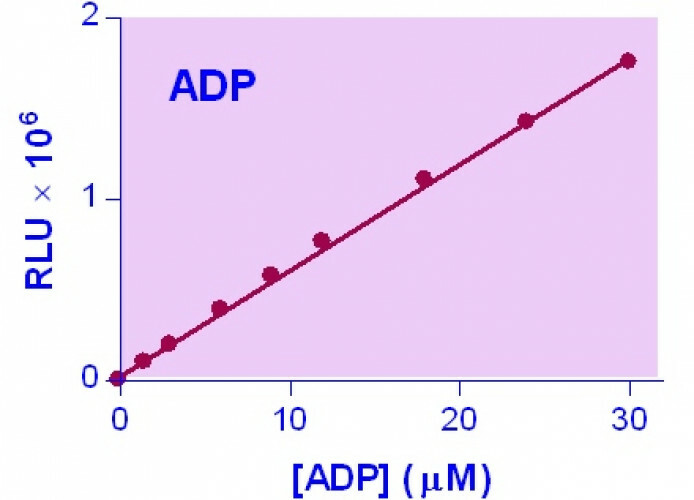 BioAssay Systems’ EnzyLight™ ADP Assay Kit provides a rapid method to measure ADP levels. The assay involves two steps. In the first step, the working reagent lyses cells to release ATP and ADP. In the presence of luciferase, ATP immediately reacts with the Substrate D-luciferin to produce light. The light intensity is a direct measure of intracellular ATP concentration. In the second step, the ADP is converted to ATP through an enzyme reaction. This newly formed ATP then reacts with the D-luciferin as in the first step. The second light intensity measured represents the total ADP and ATP concentration in the sample. This non-radioactive, homogeneous cell-based assay is performed in microplates. The reagent is compatible with all culture media and with all liquid handling systems for high-throughput screening applications in 96-well and 384-well plates. Applications For rapid, quantitative, bioluminescent determination of ADP concentration and evaluation of drug effects on ADP metabolism. References Assay: ADP in Human neuronal cells (Pubmed).